She’d already put a note on her desk as a reminder to do the task when she got to work. He’d already talked with her on the weekend about the task. He’d already texted her once before about it. Von is a “get it done” person who finds it hard to relax. So until this task was done–that he depended on Hope to do–he would be a bit nervous that she would forget. Hope didn’t really mind doing this monthly task, but she knew something had to change so that she didn’t harbor an irritation with Von. She didn’t answer the second text right away. As a person who doesn’t like her messages piling up, Hope had to choose not to respond immediately. She could have told him she had a plan for getting it done but opted to do some gentle “training” by not responding prior to work hours. Application: Ultimately, we are responsible for what we do with our phones and how quickly we respond. She did the task the same day, but not immediately. Application: Some tasks are indeed urgent, but learn to distinguish why something appears urgent. It could just be based on a co-worker or boss’ preference and not be realistic. She added it to her recurring task list. Since this task repeated around the same time each month, Hope decided to be proactive and start reminding HERSELF about it each month. She put the info needed for processing the task into the fields of her task management app, and set a reminder. Going forward, she could anticipate the work needing to be done and not rely on a reminder from Von. 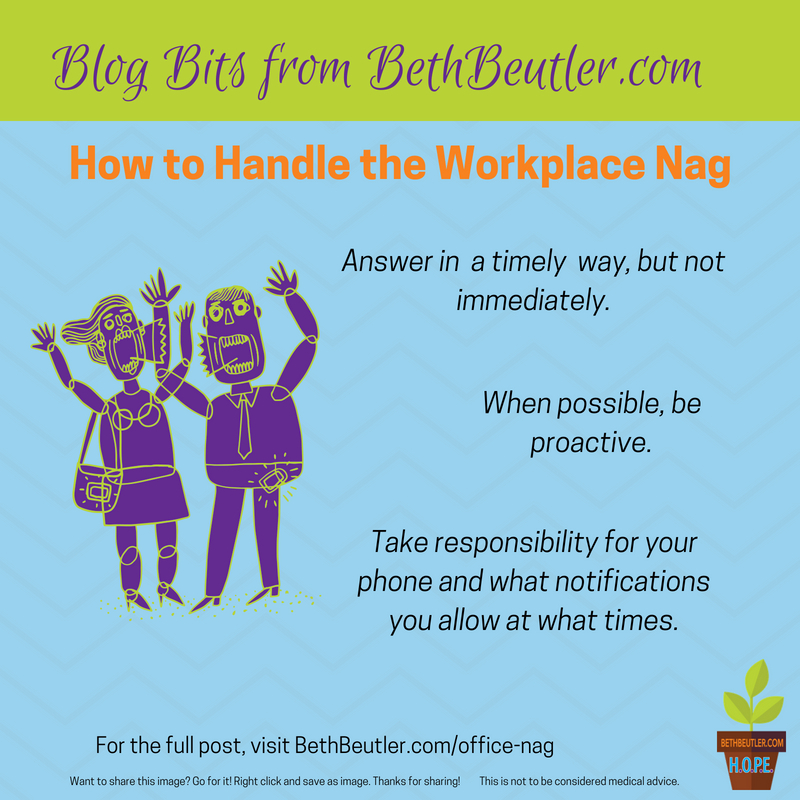 Application: taking responsibility for recurring tasks can ease the tension felt when receiving a reminder from your co-workers. She learned to be more specific in communication. The first time Von mentioned the task for the month, Hope could have been more specific about when she planned to handle it. She could have said, “I’ll confirm by 4 pm on Monday. If you don’t hear from me, feel free to remind me after that.” She determined to be more precise in her communications with Von going forward. Application: How can you tighten your messages to help avoid potential irritations with your colleagues? While others can certainly be a source of stress, we are ultimately making the choice of how to respond. What would you do? *This is a fictional story, parts of which are based on a true situation. The names Hope and Von (a masculine form of the word hope) are used as fictional characters to help with these lessons.